Major League Baseball’s 2018 Winter Meetings are set to conclude on Thursday, Dec. 13. Thus far, the Colorado Rockies have yet to make any moves, but are rumored to be in discussions of acquiring a first baseman via trade. If the Rockies are able to trade for a first baseman, all signs point to Ian Desmond moving to the outfield. 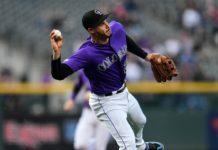 Patrick Saunders, Rockies beat writer for the Denver Post, joined Eric Goodman and Les Shapiro of Mile High Sports AM 1340 | FM 104.7 to chat about any possible moves the Rockies might make as the “Hot Stove” kicks into gear. Three names at first base have generated attention in regards to potential fits for the Rockies. Those players include Carlos Santana, Edwin Encarnacion, and Jose Abreu. “I would say Abreu’s a huge long shot,” Saunders said, but also added, “I think those are two very legit candidates for a trade,” when referencing Santana and Encarnacion. 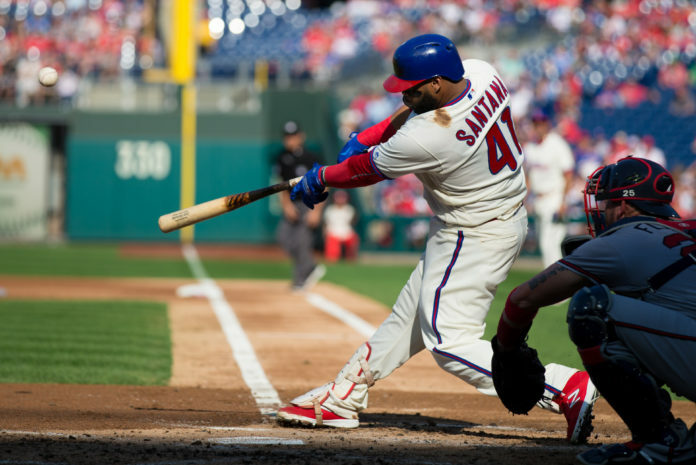 “I would think that Santana would be the more likely,” Saunders said, when asked if either Santana or Encarnacion had better odds to join the Rockies. Santana, 32, would likely be a longer-term fit than Encarnacion, who will be 36 next month, and provides better defense at first base. Encarnacion has primarily served as a designated hitter during his two-year stint with the Cleveland Indians (2017-present). It has been reported that teams have been asking about pitcher Jon Gray in a potential deal, but the Rockies are hesitant to trade the 27-year old right-hander. 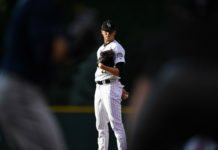 Saunders said, “They (Rockies) still believe in his talent, and are very reluctant to give up on any young arms, even if it is somebody like Jon Gray, who struggles, because they are tough to find.” Saunders also pointed out that the Rockies have invested lots of time and energy trying to get Gray adjusted to pitching at altitude and it would be a huge mistake to give up on him so quickly. As much as it seems the Rockies need to upgrade the catcher position, Saunders said, “All indications are no,” when asked if the team is looking at catchers during the Winter Meetings. Unless it is a veteran that is still available at the end of the offseason, trading or acquiring a catcher via free agency does not seem to be a priority for the Rockies, Saunders explained. Chris Iannetta and Tony Wolters were solid defensively last season, but their offense left much to be desired. General Manager Jeff Bridich may be content with playing light-hitting catchers, as long as they can handle the pitching staff and have the offensive punch come from other spots in the lineup. Click here to listen to the full interview with Patrick Saunders, including what he had to say about whether it was a mistake to sign Ian Desmond to a lucrative contract two off-seasons ago, or listen to the podcast below.